Pictures courtesy of Dave & Buster's Official Website. Arcades are dead. As home video game systems and personal computers increased in power, the popularity of the neighborhood arcade quickly diminished. Sure, you'll still see game rooms as part of larger entertainment complexes, or in malls and hotels to occupy bored kids. However, the time of the independent, self-sustaining arcade has long passed. There is one slight exception to the trend. At some point in the last decade or so, entrepreneurs realized that redemption games, arcade machines that give tickets and prizes, still filled a niche that couldn't be replicated at home. In fact, these devices fulfilled the same bad impulses that fuel the gambling desire. Mix in some alcohol and the right atmosphere, and all of a sudden those adults that were raised on Chuck E. Cheese's are throwing away cash for a chance at a giant plush gorilla. Arcades have spawned the faux casino, and Dave & Buster's are a chain of these little palaces of lesser sins. 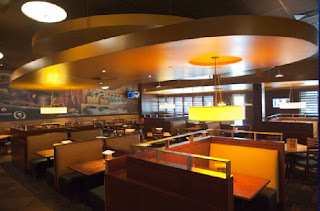 About a year ago, a location opened on International Drive in Orlando. In theory, it's a great combination, a restaurant and entertainment center designed for adults in one of the biggest tourist cities in the country. Unfortunately, the reality proves far less perfect. The first challenge when arriving at Dave & Buster's, after braving International Drive itself, of course, is the parking situation. Like many tourist destinations in Orlando, valet parking is available for an extra fee. There would be nothing wrong with this, except for the fact that parking is extremely limited. Even after extra parking spots was next to a nearby restaurant, the tiny parking area is still a miniature demolition derby as cars circle the building, trying to find any space. By the end of the night, cones are placed to create extra unmarked parking spots, and yet it's still not enough. Once you finally leave your car behind, there's just a tremendous flight of stairs to the main floor. Walking into a noisy, cavernous room, you have the choice of two paths. One leads to food, the other to the games area, but both have their own frustrations. If you choose to eat, then prepare for a long meal. This isn't because of multiple great courses or made to order delicacies. No, the wait is because Dave & Buster's employs a startling number of employees whose sole purpose seems to be to stand in a group and ignore customers. There have only been a few times I've visited a location, Orlando or elsewhere, where it didn't take at least 15 minutes just to order drinks. Any time you have to wait for a server is a long, frustrating struggle to get any kind of recognition. 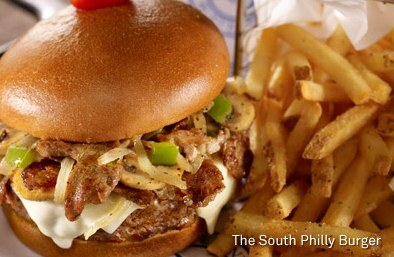 The food itself is overpriced, and the flavor never rises above mediocre. The only thing that makes some meals affordable are the Eat & Play combos, which give a slightly discounted game card with your meal. It's clear they know the restaurant exists for only two purposes, feeding customers who want to spend their evening in one place, and feeding people already drunk from the bar who can't make it somewhere else. Thus, they don't have to try, because everyone is captive already. Now that dinner is finally over, it's time to play. 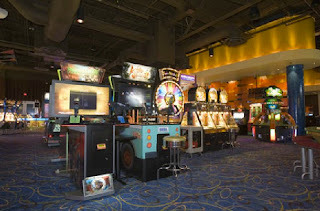 The "Million Dollar Midway" features a wide range of games, the majority of which are designed to give a few moments of gameplay and a handful of tickets. There are also a variety of games that feature some twist not usually available on home consoles, like light gun games with mounted plastic machine guns and racing games with simulated driving controls. 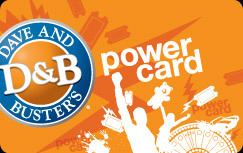 Rather than quarters or tokens, gameplay is payed for through a "Power Card" with is recharged at one of many stations. Games cost a certain amount of points rather than a monetary value, and points are purchased at different rates depending on how much you spend and what promotions are available. Officially, this allows Dave & Buster's to adjust point costs for special promotions or certain days of the week, such as half-price play available on Wednesdays. In reality, the vague value of the play points makes it easy for the customer to forget they're paying a dollar or more for a single play of a game. As mentioned, one thing they haven't removed from the arcade process is the tickets. Tickets fly out of games at a startling rate, often faster than you can fold them. Large paper cups sit everywhere to hold your winnings, and one evening of play can often fill multiple cups. You turn in tickets to an employee who counts them and places the total balance on your play card. Realistically, the entire ticket process could be eliminated, and the winning amount could be automatically added to your card. However, seeing all that paper race out of those machines is an adrenaline rush, and keeps patrons excited and spending more money. It's a manipulative process, but nothing too sinister or especially new. I'd even say it's a nice alternative to actual gambling, since much less is usually on the line. The problem becomes that without the 21 and over restrictions that casinos provide, Dave & Buster's is infested with children. As the time grows later and the gaming area fills, more families arrive at the same rate as the bar patrons. By 7:00 p.m., the floor is packed by unruly kids and staggering, half-drunk adults, all bouncing against each other trying to find a game that doesn't already have a queue behind it. It only gets worse from there. So you survive the hordes, manage to play enough games to burn through $50 dollars worth of game points, and have amassed thousands of tickets. Time for prizes! Unfortunately, you may have thousands of tickets, but all you can afford is low quality t-shirt, or maybe a mini crock-pot that retails for $10. If you have kids, you may actually get a few different stuffed animals, though you can be sure they probably cost Dave & Buster's about $2.00 each when bought in bulk. It all sounds rather awful. However, I can't deny there's a certain charm to the place, some combination of nostalgia and the thrill of winning, even if all you've won is a useless tchotchke. If you time your visit to a weekday outside of the tourist season, when promotions lower some of the excessive cost to play, it's even possible to avoid many of the flaws. Still, it makes me miss those days when I could visit the arcade with excitement, without feeling like I need to visit the easily accessible bar just to survive.